Okay, this is a long section and my personal favorite part of the book so far. Like everything else, it needs a solid rewrite and I’ll work on getting it polished for publication later. As always, I’d love any comments, thoughts, feedback, etc. I’d especially like to thank my old Champions groups with an extra shout to Wayland Smith, Mr. Gambino and Jeff Smith for some of the inspiration. Protector had run all the way to the Monitor Room. When he sat down in the central chair, he felt strangely tired. His skin seemed warm, and he felt flushed. Maybe Dr. Lord had been right to keep him off duty. He watched the Freedom Flyer take off on the roof camera. Despite how he felt physically, he wished that he could be with the others. It was what he was supposed to do. With a heavy exhale, he tried to replay the battle in the park in his head. He considered how he might have been able to stop Defiance. Perhaps if he had maneuvered in front of a shattered statue of one of the heroes of the original Freedom Squad, it might have triggered something in Defiance’s mind. There was a hero still inside that angry caped man in red and white. He had ordered the villains not to kill Freedom Squad. He had tried to talk to Alex about the Protector, Defiance’s Protector. An afternoon of concentration had yielded nothing on Defiance. Cori sat in lotus position on the floor of her bedroom and continued to project her mind, attempting to sift through the thoughts of thousands of people at a time without disturbing any of them. In many ways, the experience was similar to diving to the bottom of a pool and holding her breath. She would concentrate, telepathically send her thoughts out, shift through as many minds as she could, brushing against them ever so gently. When too many thoughts touched her mind, she’d have trouble sorting and discerning them. It would feel like she was drowning, so she’d come up for air and open her eyes. A picture of Melbourne hung on her wall, or rather the Puffing Billy Steam Railroad, outside of Melbourne. Nightstar had once asked her why she didn’t have a picture of the Sydney Opera House on a wall or Uluru if she wanted something to remember Australia. She had finally purchased and framed a picture of the Sydney Opera House and put it on the opposite wall. The truth was that though she had spent a lot of her life growing up in Australia, she was an American. Her father had gotten worried that one day his enemies might find out that he had a daughter, so he had spirited her off to Australia. She learned later that she had almost grown up in New Zealand instead, but apparently as a toddler had gotten very excited when she saw a kangaroo at the zoo. Little Cori liked kangaroos, therefore, she had to grow up in Australia. However, she had her US citizenship and had certainly spent a lot of her time in the States growing up at her dad’s house in San Francisco. She had always wanted to go to university at Stanford or Berkeley. Being a child genius, she had attended both by age 16. Now, all she had of Australia was a slight accent that she cultivated and the occasional “G’Day”. She wondered if she sounded more like an American steakhouse commercial than an Aussie. The picture of the railroad caught her eye again. It wasn’t really a picture of Melbourne or beautiful Victoria (because she would have chosen the beaches), but it was a picture about her father taking her to celebrate a day about a kid’s tank engine and riding on the train with his little girl. She loved her dad, and she missed him. She was thinking about calling him and waking him in the middle of the night, when Starlight contacted her on the communicator. She found herself wondering if Starlight was misinterpreting a news broadcast or possibly a mockumentary. She imagined that it would be hard to be an alien surrounded by modern American media sources. Strangely, she decided that Starlight was growing on her. “That,” he said simply and robotically, pointing at a large monitor screen with the image of a playing card showing on it… the Ace of Spades. Rigel felt her blood run cold. There was silence for a second. “Such a poor question from such a brilliant mind. I suspect that you had quite the experience with our friend, Carlos,” said the voice. Rigel tried to mentally contact Starlight, but she didn’t seem to be able to link with him. His alien thoughts were too strange for her. She wondered if he might be a robot of some sort or at least, some type of artificial being. She reached out to Nightstar. “Sure, JR was helping me with some engineering issues with the Night Cycle. We’ll contact Rockslide and Protector,” he thought back. “What? Why do I need to leave?” she asked. “Wait!” Cori said, but the image on the screen fell backwards and began spinning, flipping and growing smaller until it became a point of light in the center of the monitor. A second later and Doppler radar scans from the Megalopolis airport appeared on the screen. Rigel was barely listening. She knew Daniel. She could reach him telepathically. “Daniel!” she shouted. “What is it?” came the return thought. “And I know you have your suit in your briefcase. Go. You don’t have much time,” she thought. As the team got into the Freedom Flyer, a terrible thought struck her. What if they were being set up and the real attack was coming to Freedom Squad Headquarters? “Here we go. Hang on!” shouted Ion and they launched. They soared across the city. “Using the hovering engines so we don’t crash into any skyscrapers,” announced Ion. “The Ace of Spades informed Rigel of the attack on Daniel Hunter,” stated Starlight. “Who’s Daniel Hunter?” asked Ion, as he made a left turn past a bank. “Not now, Starlight,” said Rigel and Nightstar in unison. “Understood, Starlight. Nightstar, what are you thinking?” Rigel asked. “Talk time is over,” said Ion. “I’m hovering outside the restaurant.” Ion waved through the front windshield. “Ion, waving is illogical. The windshield is tinted,” said Starlight. Rigel sent out her thoughts to Daniel, explaining the plan as quickly as she could. He was in the men’s room trying to get his costume on. She projected the location to Nightstar, who wasted no time cutting a hole in reality with his psychic blade. In a flash of yellow and red light, he vanished. “Don’t say anything, Rigel. I’m heading to the park,” said Ion. Rockslide made a rumbling noise that sounded distinctly like a groan. As Ion banked the Freedom Flyer, Rigel nearly lost her balance for a second. She telekinetically caught herself and levitated off the floor. “Again, I recommend seatbelts,” stated Starlight. Cori felt a sudden chill. Something bad was about to happen. Nightstar sensed it as well. “Something bad is about to happen,” thought Nightstar. Rigel felt a sudden jolt. When Rigel arrived at Freedom Squad Headquarters, she quickly checked the Monitor Room. Starlight stood in the middle of the chamber, his featureless white facemask reflecting the colors of the different screens. Cori bit the inside of her cheek to avoid laughing. Starlight’s alieness somehow seemed much less threatening when he was trying to sound like a cartoon hero or a starship science officer. He had been the only one standing in the park after the fight, and the mayor had told her to augment the team. “Thank you, Cori,” he said flatly. “Live long and…” Starlight paused as he attempted to position his fingers. She thanked Starlight and headed down to the medlab. She wished that she knew what to do. She wasn’t sure where Defiance could be. The team could go out on patrol, but she wondered if a team of villains would just attack Freedom Squad Headquarters. “Great! What is it?” she thought back with a touch of excitement. Nightstar did have the most experience of anyone on the team, she reminded herself. “You are right. Okay, I’ll try, but first, I’m checking on Alex, Rockslide, JR and Snowfall,” she thought. “Ion. JR is his real name, remember?” she replied. Cori shook her head as she ended her conversation with Nightstar as she walked into the medlab. Dr. Jake Lord, a middle-aged former superhero once known as Dr. Hurricane, was monitoring a console next to a clear tube filled with red liquid. Alex floated inside. Although she knew about the healing tubes, it still surprised Cori to see one of her team members suspended inside one. Ion was sitting on a metal table, shirtless, with white medical tape wrapped around his torso. He was watching Alex’s tube, but also kept checking another one which was filled with stones. Cori realized it was Rockslide. “How are you doing?” she asked Ion. “I’m staying on duty too,” gasped Protector as Dr. Lord helped him out of the tube. “I don’t think so,” said Cori, walking over to him. “I saw you after that fight. You took on Defiance, and you have no powers, remember?” Her voice softened. Alex needed to be okay. “But I’m the Protector,” he coughed. “Am I cleared? I need to help stop Defiance. The last Protector did,” said Alex. Dr. Lord pressed a stethoscope against Alex’s chest and made him take several breaths. Cori watched Dr. Lord shine a light in Alex’s eyes. The pupils dilated. “I feel okay, Doc,” said Alex. “His medical readings look fine,” offered Cori, who immediately regretted speaking up. “Alex, you should listen to the doc. I saw how you looked at the end of that battle. Those zombies the cops shot looked healthier. Please,” said Ion. Alex shrugged. “I’ll obey doctor’s orders,” he said reluctantly. “Good,” said Dr. Lord, “Now I only have one patient to worry about. You two can go.” Ion and Protector got up and left. Dr. Lord turned to face Cori. “Me?” she asked, pointing at herself. “Oh, yeah. This is wonderful!” he thought. For the briefest of instants, Cori wondered if Dr. Lord could be the Ace of Spades. In the next instant, she decided that she was getting way too paranoid for her own good. And in the instant that followed, she had an idea. The healing tube containing Rockslide swung open, and the hulking member of Freedom Squad reassembled himself. He took a few steps and looked around the medlab. “Better,” he rumbled. Here’s my effort to get to the second day goal and stay on track. Everything’s a bit raw. I had an idea as well to write up a Freedom Squad Roll Call to insert at the beginning of the novel to help my reader keep track of things. I’m going to keep writing through the day, but I hope everyone’s doing well with the writing. One thing that I like to tell myself is that Nanowrimo is won not on the days when I’m inspired and the words flow easily, but on the tough days when I only get 100 words done. So, if you are participating, remember that no matter who stuck you may feel at the moment, every little bit does help. “Am I allowed to curse if I’m a member of Freedom Squad?” said Ion as he stared out of the cockpit of the Freedom Flyer into a scene of carnage. Smoke poured from the super-powered wing of the jail and several massive walls had collapsed into a mountain of rubble. The scene resembled a bomb explosion. A woman ran out of the rubble, her body gleaming as if it were made of gold, which of course, in her case, it was. “That’s Golden Glory,” said Protector. “Meet me on the ground,” said Nightstar, who whirled his blade and vanished. Meanwhile, Golden Glory, the former model and now maiden of metal, could see nothing ahead of her but freedom. She ran as fast as she could, wishing that she had superspeed to go with her near-invulnerability and super strength. Nightstar thrust his sword into her chest. She gasped and collapsed to her knees, eyes wide. Golden Glory fell face first on the ground, unconscious. “Look, a hero,” came a shout. A bald man floated in the air toward Nightstar. An enormous lumbering, slavering semi-human creature built like an overzealous mess of claymation followed him. An invisible force clamped Nightstar’s arms to his sides, and he couldn’t expand his ribcage to breathe. His psychic blade flickered and vanished as pain disrupted his concentration. He wondered why he had been so stupid to rush off by himself like a rookie. It wasn’t like he needed to impress anyone. “Rawrr!” snarled Monstrosity as he charged at Nightstar. Nightstar closed his eyes behind his mirrorshades. This was going to hurt. Nightstar opened his eyes in time to see the large humanoid flying through the air to smash into Super-Ego. Both men crashed to earth, but Monstrosity flew upward into the air again, hovering above Super-Ego before the super-villain discarded the creature with a gesture. “He may be Nightstar, but he’s a member of Freedom Squad,” said Rigel. 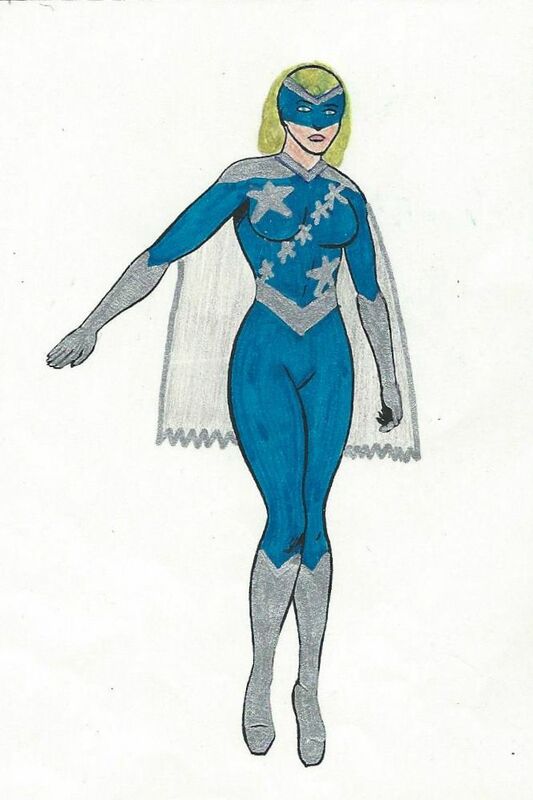 She landed between Nightstar and Super-Ego, her cape billowing behind her as the stars on her blue costume nearly seemed to glow. The invisible force that had pinned Nightstar’s arms was gone. Rigel and Super-Ego had locked gazes, and though Nightstar couldn’t see anything, he knew that a war was raging between the two. He took a breath. He wasn’t going to let Rigel lose that war. He re-ignited his psychic blade. Monstrosity stood with a roar, but Rockslide was now rumbling toward the creature. Stone clashed with flesh as the two powerhouses rained blow after blow upon each other. The ground trembled. A charge filled the air. A bolt of lightning struck Super-Ego then crossed with an arc to Monstrosity. The self-proclaimed Master of the Mind collapsed. Monstrosity roared louder as Rockslide continued to pound him. Rockslide and Monstrosity traded yet more seismic blows. Nightstar thought he felt another set of tremors that couldn’t be explained by either Rockslide or Monstrosity. With that, Rigel flew into the air, carried aloft by her own telekinesis. She landed near a huge wall, reached out with her right hand and slowly the mass of concrete, reinforced with titanium steel and who knew what else, rose into the air. “Okay, maybe I am trying to impress someone,” muttered Nightstar. “What was that?” asked Ion. Ion raced off. He was certainly fast, but he didn’t have the speed to compete with a real speedster like Sprynt of the super-powered mercenary organization Wildside. He was started to get worried. There were a lot of villains imprisoned here. He paused as he entered the corridor through the very thick, but very shattered wall and pulled out his communicator, activating its cell phone feature. He vaguely wondered what was powerful enough to shatter a wall that thick. “Is this Wildside, Inc.? How much do you charge to stop for a full scale super-prison break?” Ion asked. “I’m sorry, sir, who are you with?” came a voice on the other line. “Don’t try and stop me, hero,” shouted a woman. Ion hung up the communicator. It had seemed like a decent idea to hire help, and a speedster like Sprynt might have made it here in time to assist. Of course, the woman who had shouted at him probably had ruined her chance to escape. He could hear a loud clanging sound coming from the opposite end of the corridor. The woman had a guard trapped in a headlock and based on the way the man’s eyes were rolled back in his head and the white foam at his mouth, Ion guessed that she had some type of toxic touch. Still, her eyes widened. “You move at lightspeed?” she said with more than a hint of fear. She looked at her hostage, and Ion could see her weighing her options of reacting faster than someone who could move at lightspeed. He decided to blast her in the legs. She stiffened and fell as if she had been hit with a super-powered taser. Which made sense to Ion, as he kinda was a super-powered taser. “Oh, by the way, just for fact-checking purposes, I can’t really move at lightspeed, but my electrical bolts do,” Ion said to the unconscious villainess. She looked like she was okay, unconscious, but okay. Ion decided that he wasn’t going to chance touching her. Ion checked the guard’s belt and retrieved a set of neutralizer cuffs. He quickly and carefully clamped them on the woman. Another guard, a short middle-aged black woman, ran up. “I’ll help him. You’ve got to get down there.” She pointed in the direction of the clanging. “What’s going on?” Ion asked. “Did you get concussed? Yes, Protector, and I bet he’s going to need your help,” she said. Outside, Nightstar’s psychic blade had given Rockslide the upper hand on Monstrosity, and the enormous mutant lay barely moving on the ground. In the meantime, both heroes had encountered more than their fair share of potential escapees. Without their costumes, Nightstar had no idea who he was fighting, but the shock of the psychic blade wasn’t going to kill anyone, so he gave all of them an equal opportunity to be struck down. Rigel heard Ion’s message, and for the moment, she thought she had rescued everyone trapped in the rubble. Several guards rushed past her. Based on the number of flashing red and blue lights and police now on the scene, it seemed the authorities were establishing control. Cori looked over and saw Rockslide backing almost a dozen prisoners up against one of the prison’s still standing walls. For his part, Nightstar was engaging three prisoners, one of whom was wreathed in glowing green lights. The glowing green prisoner threw a globe of energy at Nightstar, but he blocked it with his psychic blade, discharging it with a popping noise. Unfortunately, one of the other prisoners performed an impressive flying kick at him from the opposite side, knocking Nightstar to the ground. The third prisoner decided to make a run for it. “Oh, I don’t think so,” said Rigel under her breath. She was tired, having used most of her energy to lift walls and battle with Super-Ego, but she wasn’t about to have her team go down. She fired a mental bolt at the martial artist, sending him to sleep almost as quickly as Nightstar’s blade would have. She then gestured and telekinetically grabbed the green globe guy, lifting him up into the air before dropping him. She gave him a slight mid-fall adjustment to make sure he wouldn’t break his neck. The escaping prisoner ran into a group of police, stopped and raised his hands. It didn’t take long to reach them. Rigel saw Ion standing behind Protector while a unshaven man with shoulder-length blond locks wearily punched Protector’s shield. Ion fired an electrical bolt. Rigel concentrated and released a telepathic blast. Uberdude staggered and then fell over.